Payment Mode- DD in Favour of "Director, Rajendra Institute of Medical Science, Ranchi" Payable at 'Ranchi'. Principal- Passed M.Sc Nursing with 15 year work Experience in Similar Field out of Which 12 year Teaching Experience. Vice Principal- Passed M.Sc Nursing with 12 year work Experience in Similar Field out of Which 10 year Teaching Experience. Lecturer- Passed M.Sc Nursing with 3 year Teaching Experience in Nursing College. Principal- Passed M.Sc Nursing/B.Sc Nursing/Post Basic B.Sc Nursing with 2 year work Experience in Similar Field. Eligible Candidates can Submit Nursing College RIMS Teaching Positions 2019 Application to the Official Address Latest by 30th April 2019. Applicants First Open RIMS Ranchi Official Website. Open Recruitment Link in Careers Section. 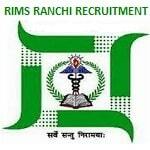 Click on Faculty Positions in Nursing College, RIMS Ranchi Advertisement link. Pay Application Fee Through DD. Fill Application form, Affix Colour Passport Size Photograph, Send Application Along with Required Documents in a sealed Envelope. Send Application to the Address : Director, Rajendra Institute of Medical Sciences, Ranchi- 834009, Latest by 30th April 2019 by Speed/Registered Post.